Hudson O'Neal celebrates his first career East Bay win. What won the race: Rallying from a lap-10 spin, Hudson O’Neal of Martinsville, Ind., nipped Earl Pearson Jr. of Jacksonville, Fla., at the line in a photo finish to win Thursday’s Lucas Oil Late Model Dirt Series feature at East Bay Raceway Park. Pearson finished second, while early leader Tyler Erb was third. O’Neal earned $7,000 for his first career East Bay Winternationals victory. On the move: Race winner Hudson O’Neal, who started 13th, was among five drivers who improved at least 12 positions. Devin Moran went from 17th to fourth; Brandon Overton from 20th to eighth; Allen Murray from 21st to ninth; and Austin Rettig from 26th to 13th. Winner's sponsors: O’Neal’s winning Longhorn Chassis is powered by a Clements Race Engine and sponsored by Dyno One, Tarpy Trucking, West Side Tractor Sales, VP Racing Fuel, Penske Racing Shocks, Swift Springs and FK Rod Ends. GIBSONTON, Fla. — Rallying from a lap-10 spin, 13th-starting Hudson O’Neal of Martinsville, Ind., nipped Earl Pearson Jr., of Jacksonville, Fla., at the line in a photo finish to win Thursday’s Lucas Oil Late Model Dirt Series feature at East Bay Raceway Park. O’Neal’s improbable rally, which came on the fourth night of the 43rd annual Wrisco Winternationals, stole the spotlight from red-hot Tyler Erb of New Waverly, Texas, who led more than half of Thursday’s 40-lap main event, and Pearson, the series points leader who had just wrestled the lead away from Erb when O’Neal pounced on the leaders as they battled down the backstretch. O’Neal’s first career victory at East Bay paid $7,000 and makes him and his father, Don O’Neal, just the second father-son duo to register Winternationals victories at the tricky third-mile oval just outside of Tampa. The late Jack Boggs and son Jackie, are the only other father-son combination to accomplish the feat. O’Neal needed all 40 laps to get the job done. After recovering from the early spin, he rallied through field — aided by nine more caution flags — and was in the right place at the right time to surprise both Pearson and Erb. With Erb trying to protect the bottom while holding off the low-running Pearson, O’Neal cruised by on outside. He took the lead on the white-flag lap and then beat Pearson across the line by a scant .031 of a second, less then the length of his car’s nosepiece. Erb, who dominated the middle stages of the caution-filled event, finished third, while Devin Moran of Dresden, Ohio, finished fourth, his best finish since joining the Dunn Benson Motorsports team. Early leader Kyle Bronson of Brandon, Fla., completed the top five after pacing the first seven laps. It was the red-hot Erb — winner of three of five Georgia-Florida Speedweeks features entering Thursday’s race — who took the lead from Bronson on lap eight and appeared to be on his way to his third East Bay victory. But a string of cautions — including five from laps 10 through 15 — never let the Best Performance Motorsports driver get too far out front. With each restart, drivers fanned out to give the outside line a try. With Bronson leading the charge first, he was eventually joined by Jonathan Davenport or Blairsville, Ga., and O’Neal, who was still mired deep on the pack at the halfway mark. Davenport, who had been in and out of the top five, was back up to fifth when a caution waved on lap 34 for debris. On the restart, he again mounted another charge. After swinging to the outside of Pearson to grab second, Davenport tossed his Lance Landers-owned No. 49 to the outside in turn three, but Erb, attempting to slow Davenport’s momentum, drove up the hill in front of him. Davenport slid high and banged off the fence in a shower of sparks before coming to a stop to draw the 10th caution of the feature. Davenport’s high-side charge — along with the caution with five laps remaining — was exactly what O’Neal needed to help complete his rally. “I found something around the top,” said O’Neal. “I didn’t know if it was good enough to win the race or not. I seen Davenport get up there. (He had) a little bit of misfortune, but I’ll take one any way I can get it. He showed me the line there and I just took advantage of the leader not knowing what to do. What a great feeling coming from the tail, twice. Pearson, who dogged Erb throughout the race, thought everything had gone his way when he slipped under Erb as they exited turn two with just two circuits remaining. While stalking Erb, he anticipated having to possibly battle the high-flying Davenport for the win, but instead it was O’Neal who stole the show. “Davenport got going on the top there, but it was awful treacherous you know if you got in the black you couldn’t do anything,” Pearson said. “That’s probably the closest finish in history here, I don’t know. “On them restarts, it was pretty tough to get going there. I seen Davenport go out there and then Erb was gonna try to go out there, but I was gonna stay in the bottom of course. All in all, it’s a good night for us and I’m sure all these fans seen one hell of a race right there. Notes: Hudson O’Neal, 18, is just the third teenager to win a main event in Winternationals history. Tyler Reddick of Corning, Calif., was 15 when he won on Feb. 9, 2011 and Bobby Pierce was 17 when he won on Feb. 15, 2014. “I can’t thank everybody enough on this race car, Todd Burns for giving me this opportunity and bringing me down here,” said O’Neal in victory lane. “It’s been a pretty tough Speedweeks so far, we haven’t had any luck. To finally have some luck, it definitely shows.” … Tyler Erb missed a golden opportunity to become the first driver since Batesville, Ark.’s Billy Moyer in 2015 to win three Winternationals features in a single season. “I think I just let it go there, missing the bottom the last two laps. So we’ll take it and move on to tomorrow,” said Erb. … Tanner English of Benton, Ky., managed a sixth-place finish after drawing a caution when he nearly looped his car in turn four. English kept rolling but the yellow had already been displayed, forcing the Stone-Weaver Racing driver to tag the rear of the field. … Nineteen of the 26 starters completed all 40 laps. … Austin Hubbard of Seaford, Del., ran as high as third before fading to 10th. … Overall fast qualifier Mike Benedum of Salem, W.Va., finished 19th after taking a fast-time provisional to start the feature. … Josh Richards of Shinnston, W.Va., completed just six laps after switching to a backup car due to engine woes in his primary Clint Bowyer Racing No. 14. ... With Brandon Sheppard and Dennis Erb Jr. skipping East Bay Thursday to head to Georgia’s Screven Motor Speedway, only seven drivers have started all six Georgia-Florida Speedweeks features thus far without the help of a provisional: Don O’Neal, Brandon Overton, Jimmy Owens, Jonathan Davenport, Kyle Bronson, Tim McCreadie and Tyler Erb. Row 1: Kyle Bronson, Earl Pearson Jr.
Jonathan Davenport has five career Winternationals victories after his score on Wednesday night, but none of them have come consecutively. He’ll shoot for his first back-to-back triumphs at East Bay starting from the fourth position in the 40-lap feature. … Four of the six heat winners — Davenport, Kyle Bronson, Earl Pearson Jr. and Tyler Erb — are previous Winternationals victors. Stormy Scott and Tanner English, meanwhile, are bidding to reach the third-mile oval’s victory lane for the first time. … Billy Moyer rallied to finish second and transfer to the A-main after slowing to bring out a caution flag early in the fifth heat. The problem with his Tye Twarog-owned car? Its crank trigger went out so he switched over to use the distributor for the remainder of the race. … Mike Benedum started from the pole position in the first heat after registering the evening’s fastest lap in qualifying, but he slipped backward and out of a transfer spot, finishing fifth. The West Virginia veteran gained entry to the feature, however, with his fast-time provisional, providing a reward for his team’s hard work to repair his car following his hard slam of Jimmy Owens’s spun machine in Wednesday night’s A-main. They had to do some welding to the car to fix right-side frame damage and also use old right-side sheet metal to replace the battered pieces that Benedum allowed a fan to take from his pit stall. … Josh Richards was fifth-fastest in his qualifying group but was stopped in his tracks by an apparent burnt piston during time trials, sidelining his Clint Bowyer Racing entry for the night. He will start the feature in his backup car using a provisional and then come back tomorrow with a replacement powerplant under the hood of his primary mount. … Devin Gilpin quickly changed into street clothes after a heat-race scrape sent him spinning on the backstretch. He expressed frustration with his performance and indicated that his Jim Beeman-owned team was likely heading home early after their DNQ. 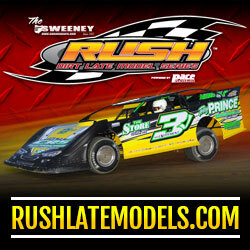 Finish (winner transfers): Austin Rettig, Devin Dixon, Billy Moyer Jr., Justin Williams, Shanon Buckingham, Joey Moriarty, Johnny Pursley, Jonathan Rowan, Tyler Carpenter, Dan Stone, Zack Dohm, Freddie Carpenter, Blair Nothdurft, Rusty Schlenk, Joel Callahan. First consolation (top two transfer): Don O’Neal, Allen Murray, Austin Rettig, Billy Moyer Jr., Shanon Buckingham, Johnny Oursley, Joey Moriarty, Tyler Carpenter, Rusty Schlenk, Blair Nothdurft, Joel Callahan, Zack Dohm, Colton Flinner, Colton Horner, Geoff Carey, Mike Benedum. Second consolation (top two transfer): Brandon Overton, Jeff Mathews, Justin Williams, Gregg Satterlee, Devin Dixon, Michael Lake, Greg Oakes, Matt Cosner, Dan Stone, Jonathan Rowan, Freddie Carpenter, Chad Stapleton. Scratched: Josh Richards. After holding off an early challenge from Morgan Bagley, Tanner English of Benton, Ky., eased away to win the final heat. Bagley settled for second, 2.945 second behind English. Vic Hill turned back charges from Jeff Mathews and Matt Cosner to pick up the third and final transfer spot. The lone caution waved for Greg Oakes, who spun in turn two after contact from Mathews. Finish (top three transfer): Tanner English, Morgan Bagley, Vic Hill, Jeff Mathews, Matt Cosner, Greg Oakes, Dan Stone, Kerry King. Jonathan Davenport easily won a raucous fifth heat. While the Blairsville, Ga., pulled away for the win, it was a free-for-all behind him as Billy Moyer, Terry Casey and Justin Williams battled for second. Moyer brought out a caution on lap two but rallied from the tail to finish second. The second caution waved on the restart when Williams tried to squeeze between Devin Gilpin and Casey on the backstretch, resulting in Gilpin spinning. Casey held off Williams for third, while Michael Lake was fourth. Gilpin finished fifth after going to the rear. Josh Richards was scheduled to start on the pole, but engine trouble forced him to scratch as his team hurried to get a back-up car ready. Finish (top three transfer): Jonathan Davenport, Billy Moyer, Terry Casey, Justin Williams, Michael Lake, Devin Gilpin, Chad Stapleton. Scratched: Josh Richards. Outside front row starter Earl Pearson Jr. of Jacksonville, Fla., beat polesitter Brian Shirley into turn one and then set sail in the fourth heat. Pearson led the distance to win by 2.754 seconds over Jimmy Owens. Owens grabbed the second position from Shirley on lap six, but facing a nearly three-second gap behind Pearson, he was unable to make up ground on the leader. Shirley settled for third to take the final transfer spot, with Brandon Overton and Gregg Satterlee completing the top five. Finish (top three transfer): Earl Pearson Jr., Jimmy Owens, Brian Shirley, Brandon Overton, Gregg Satterlee, Devin Dixon, Jonathan Rowan, Freddie Carpenter. Polesitter Stormy Scott of Las Cruces, N.M., slipped ahead of Tim McCreadie on the opening circuit and held the New Yorker at bay for all 10 laps on his way to winning the third heat.mcCreadie tried the outside, but couldn’t make up ground on the leader. Devin Moran emerged from an early battle with Billy Moyer Jr. and Colton Flinner (Wednesday’s feature polesitter), to pick up the third and final transfer position. Finish (top three transfer): Stormy Scott, Tim McCreadie, Devin Moran, Billy Moyer Jr., Colton Flinner, Johnny Pursley, Joel Callahan, Blair Nothdurft. Continuing to flex his Speedweeks muscle, polesitter Tyler Erb of New Waverly, Texas, rolled to a convincing victory in the second heat. Erb shot to the lead on the start and was never seriously challenged in winning by 3.365 seconds ahead of Warrior Race Cars house car driver Ryan King. King was comfortably ahead of the battle for the final transfer spot, which Austin Hubbard grabbed on the final lap from Allen Murray. Finish (top three transfer): Tyler Erb, Ryan King, Austin Hubbard, Allen Murray, Austin Rettig, Shanon Buckingham, Joey Moriarty, Zack Dohm. Sliding ahead of race-long leader Jason Jameson on lap nine, Kyle Bronson of Brandon, Fla., won the opening heat to earn the pole for Thursday’s 40-lap feature. Jameson led from the opening lap, turning back a mid-race charge from Hudson O’Neal before going under attack from Bronson. Broson caught and passed O’Neal down the backstretch and then made his move for the lead a lap later. Jameson finished second, while O’Neal was third. Fast qualifier Mike Benedum slipped to fifth behind Don O’Neal. Finish (top three transfer): Kyle Bronson, Jason Jameson, Hudson O’neal, Don O’Neal, Mike Benedum, Rusty Schlenk, Colton Horner, Tyler Carpenter, Geoffrey Carey. Row 1: Brian Shirley, Earl Pearson Jr.
Mike Benedum of Salem, W.Va., set fast time during Thursday’s 43rd annual Wrisco Winternationals qualifying, a day after he was involved in a hard crash with Jimmy Owens while competing in Wednesday’s Lucas Oil Late Model Dirt Series main event at the third-mile oval. Benedum was the 10th driver to hit the track during the first qualifying group. His outstanding lap of 14.681 seconds held up through 39 other qualifiers, putting his No. 25 on the pole of the first heat race. Brian Shirley of Chatham, Ill., continued to display good speed as he stopped the clock at 14.848 seconds to top the second group. He’ll start on the pole of the fourth heat. Benedum and Shirley were among six drivers to get into the 14-second bracket. Other heat polesitters: Tyler Erb of New Waverly, Texas; Stormy Scott of Las Cruces, N.M.; Jonathan Davenport of Blairsville, Ga.; and Tanner English of Benton, Ky.
With the wonderful weather continuing — another day with sunny skies and a high temperature reaching 80 — the entry list for Thursday night’s Round 4 of the Wrisco Industries Winternationals numbers 49 cars. … Scott Bloomquist of Mooresburg, Tenn., won’t race this evening due to a Lucas Oil Series penalty levied on him because it was determined he had someone else drive his car in Tuesday night’s feature. Bloomquist gained entry to the 30-lapper thanks to a Lucas Oil provisional but was not at the track when his car rolled onto the track and made several laps to be credited with a 26th-place finish worth $500; he had to forfeit the prize money — which goes to Mike Benedum of Salem, Wis., the driver who was next in line for a provisional — and was also fined $1,000 and banned from participation in Thursday’s non-points action. … Brandon Sheppard of New Berlin, Ill., and the Rocket Chassis house car team as well as Dennis Erb Jr. of Carpentersville, Ill., departed East Bay following Wednesday’s action to head for an open practice at Screven Motor Speedway near Brunswick, Ga., preceding the Friday-Saturday World of Outlaws Morton Builders Late Model Series doubleheader. … Joining the field for the first time this week are Chad Stapleton of Edinburgh, Ind., and Johnny Pursley of Clover, S.C., who is making his first East Bay since running a Crate Late Model at the track about a decade ago. … Cross Lanes, W.Va.’s Dohm Racing team will enter just a single car on Thursday but with a twist: Tim Dohm will step out of his No. 6T and let his son Zack handle the driving duties. … During the drivers’ meeting Lucas Oil Series director Rick Schwallie addressed the starting procedures that were questioned by competitors after several controversial original starts and restarts during Wednesday’s program. He said officials will try placing a cone at the start line in turn four this evening and penalize drivers who get out of line before passing it. … There were many heavy hearts in the pit area Thursday after the Dirt Late Model community learned that longtime crewman Richie Davis passed away overnight after a short battle with cancer. Series chaplain Russ Ward offered a prayer of remembrance during the drivers’ meeting for Davis, who most recently worked for Clint Bowyer Racing. … Hudson O’Neal of Martinsville, Ind., and Jason Jameson of Lawrenceburg, Ind., bolted spare powerplants in their cars for Thursday’s program after each experienced terminal engine trouble on Wednesday. Snapping the two-race East Bay win streak of Tyler Erb, Jonathan Davenport of Blairsville, Ga., picked up his first series victory during a thrilling 40-lap main event on Wednesday. Erb, of New Waverly, Texas, had won three of four Lucas Oil Series races this season before Davenport managed to slow down the new Best Performance Motorsports driver. Still, Erb managed a runner-up finish after starting eighth and has yet to finish outside the top four during this year’s Georgia-Florida Speedweeks. Erb and Davenport are also the only two drivers who have led more than one Speedweeks feature this season. Earl Pearson Jr. (Saturday’s winner at Georgia’s Golden Isle Speedway), Josh Richards, Scott Bloomquist, Brandon Overton and Wednesday’s fast qualifier Brian Shirley will be among those looking to break through at East Bay on Thursday. Row 1: Bronson, Pearson Jr.